Ann Arbor’s Universal Robots, a company that develops collaborative robots, or cobots, that work safely alongside workers with no need for safety guarding in most scenarios, Wednesday announced it has created the first solution for random robotic case erecting, the XPAK ROBOX. The new cobot erects any box in its suite on-demand without changeover. “This collaborative design not only enables the operator to safely and intuitively interface with our machine, ROBOX also realizes approximately 60 percent reduction in terms of the footprint required for a similar machine using more conventional robotic technology requiring fencing,” says William Reilly, technical sales engineer with XPAK. The XPAK ROBOX is equipped with a UR10e cobot arm that picks a flat box from one of two magazines, squares the case, and folds and seals the bottom flaps with tape. 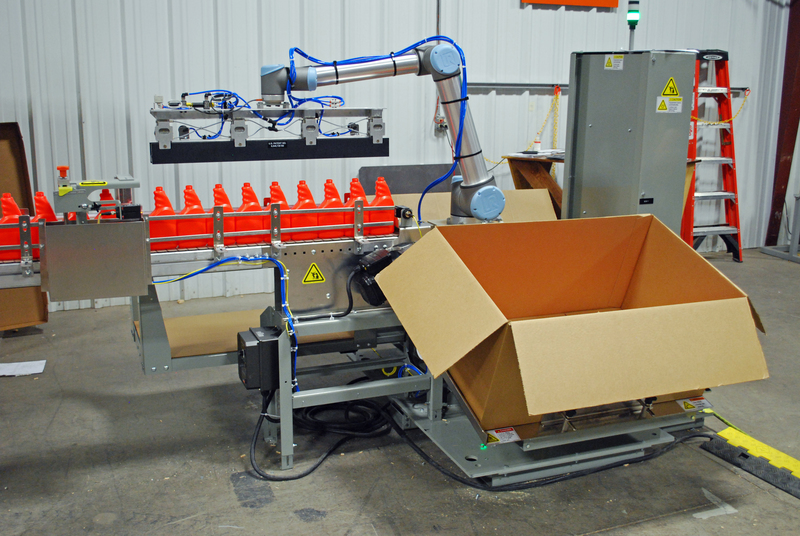 Additional magazine and custom box conveyance options allow the cobot to integrate into any packaging environment. The UR10e is the largest cobot in Universal Robots new flagship line, the e-Series, which will be showcased for the first time at Pack Expo from Oct. 14-17 in Chicago. The line adds force and torque sensing, safety features, and improved precision for a wider range of applications. It started shipping in August. At the expo, Universal Robots will also launch the new PalletizUR from ONExia, a portable, collaborative palletizing system that features a UR10e cobot with graphic software for simple pallet building. The system requires no written code to program. Collaborative robotics is now the fastest-growing segment of industrial automation.